Back in December 2004, the dollar swooned to 80 on the Dollar Index (DXY), and The Economist magazine ran a cover suggesting the dollar's demise. As the chart below shows, the dollar shrugged off its lethargy shortly after and climbed 15% over the next year. Was this a long-term reversal? No, as the dollar resumed its decline a year later. But in the meantime, all those betting against the dollar suffered losses for over a year. Here is the current cover of The Economist. Need I say more? Below is a chart of the dollar with the date of the previous Economist Cover Indicator. My first market mentor used to say that it's never what the market already knows that causes big moves, it's what the market doesn't know. 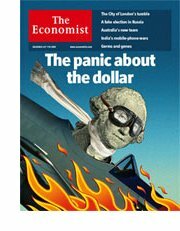 As this cover indicates, the market knows all about the dollar's weakness and its structural woes. Therefore it behooves us to ask: what might cause the dollar to again shrug off the universally negative sentiment and actually rise by 15% or more? Two frequent contributors sent in very interesting comments which help elucidate just how the dollar might strengthen despite the nearly universal opinion that it is doomed. If there is a greater bubble than the US one, with more corrupt lending and worse accounting, its the Chinese one. When this one bursts, a flood of money might well flow back into relative safety of dollars. Accounts of the dollar's short term death might be premature. It might spike amazingly before it goes bad. You will have heard the story about the salesman the systems engineer and the bear? They are camping and see a bear ambling towards them. The salesman starts to put on his running shoes. The engineer says, you don't think you can outrun a bear? The salesman says, I don't have to, I only have to outrun you. The US doesn't have to be safe, just safer, and doesn't even have to be safer for very long. (emphasis added--CHS) It just has to be safer than the Asian currencies for a short time, and it will bankrupt a lot of dollar bears. "HSBC says it reached the $246 billion figure using a formula that assumes China's foreign-exchange reserve expanding at between $30 billion and $40 billion a month, while appreciation of the yuan would be held to 7% against the U.S. dollar. The formula assumes that little of the money will head into global bond markets as the yuan appreciates rapidly and U.S. Treasury yields decline." "HSBC said that next year Chinese authorities will likely approve $10 billion in overseas investments to mutual funds each month, while $67 billion will be invested through China's sovereign wealth fund, or China Investment Corp., and $27 billion will come from the "through train" investment scheme, which is likely to come into effect during the second half. Fund outflows that have been approved but not yet utilized will make up some of the remainder." My thoughts on this are very simple: no matter where they start investing their money, prices will be effected elsewhere since any reasonable investors who have assessed their markets as overvalued will invest elsewhere. The other intuition is political: perogatives could take over from financial goals ergo outpace appreciation of yuan (my assumption). Hence they could invest in companies that are industrially important for future development in China. Gov'ts aren't great investors I would think but who knows maybe if they pay their fund managers $3000 dollars a month they will perform just as well as Peter Lynch, or Carl Icahn (sarcasm intended). The wisest solution to this would have been to actually allow people in China to receive gains from Yuan appreciation while it seems like it would have slowed export growth it probably would have increased domestic demand of all goods and shored up stability of demand. Could non-U.S. capital provide a possible prop for the dollar? If all these Sovereign Funds/ government-mandated pools of capital start buying assets--total assets in these funds are supposedly in the $1.2 trillion range and estimated to reach $5+ trillion in a few years--some will surely be made in in the U.S. (25% of global GDP), especially if the weak dollar has put some U.S. assets "on sale." These investments would be made in dollars, meaning the funds have to buy dollars to make the investments. That would serve to strengthen the dollar, regardless of how other currencies were performing vis a vis the dollar. And as Protagoras observes, the dollar (and by proxy, the U.S.) doesn't have to be safe--it needs only to be perceived as safer for a relatively short period of time. Thank you, Protagoras, Albert T. and U. Doran for contributing to our understanding of the dollar's moves--and a hat-tip to The Economist for the infallible Cover Indicator. Thanks to you, readers, this small outpost on the Great Worldwide Web received over 100,000 visits (by 51,826 unique visitors) last month--the first time it has been so honored by more than 100,000 readers. Thank you, Tom S., ($50), for your outrageously generous third contribution to this humble site. I am greatly honored by your readership and support. All contributors are listed below in acknowledgement of my gratitude.